It should come as no surprise that a white button down shirt is one of the most versatile pieces in your wardrobe -- able to be dressed up or down depending on the occasion and easily transitioning across all the different things you have to do in a week, whether it be dressing up for work, grabbing drinks with friends, heading to the beach or checking out the farmers market. But something that might surprise you is just how many different ways there are to wear a cotton button -down shirt, beyond simply putting it on and buttoning it up. An oversized style can be knotted, belted, buttoned and tied in more ways than I can count, making it the hardest working piece you own. Read on to see four of our favorite ways to wear it. 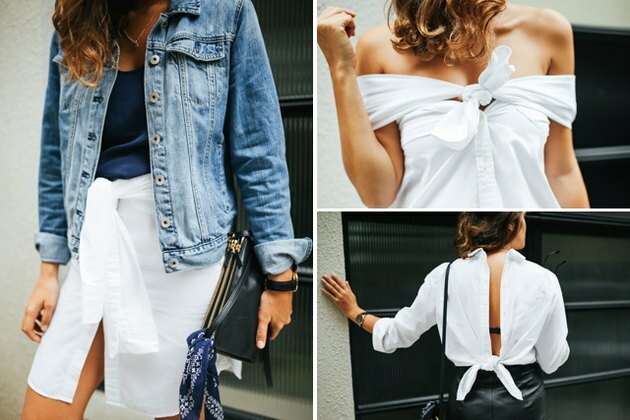 Did you know it's possible to wear a large button down shirt as a skirt, without the help of scissors or any complicated techniques? It couldn't be easier. A tip from us: Borrow one from the boys for this style! Put the shirt on around your waist and button it up as far as possible. Tuck the collar into the back. Tie the arms at the front in a bow. Perfect for easy weekend styling! Turn the concept of the classic white shirt on its head by wearing it backwards. By tying a sweet bow and wearing a minimalist bra, you can create the perfect street style look. Turn the shirt around so the back is at the front. Fold the shirt up so it is cropped. Pull the ends of the fabric up and tie into a double knot. Spread the ends out so they look like a bow. Pair this cute style with more edgy accessories for an off-duty look. The front is just as cute as the back! Off-the-shoulder styles continue to be popular, which is great because it's possible to create your own using a simple oversized white shirt! The perfect combination of elegance and fun. Put the shirt on with your arms outside. Button the shirt up to above your bust. Pull the arms of the shirt around behind your arms, and bring them to the front. Tie them in front of your bust. Voila! Finally, after you've mastered the above ways to wear a white shirt, this slightly more complicated one shoulder style will up the ante, creating the perfect evening look. It will add drama to an existing white shirt without you having to cut, glue or sew. This style is best worn with a high-waisted shirt or trousers. Put your white shirt on normally. Remove one of your arms from the shirt. Take that shirt's arm and bring it around your front so it creates a belt style across the shirt. 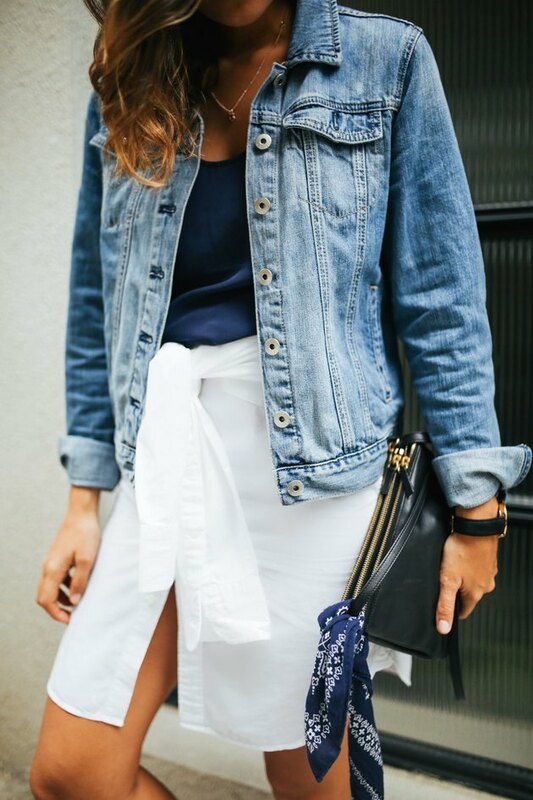 Tuck the arm of fabric into the waistband of your high waisted skirt or trousers.